(Manzanita, Oregon) – For such a tiny town, the place has its numerous legends of treasure, pirates and even a few paranormal tales. Some of it has its roots in real events, like the ancient ship known to have crashed here in the 1700's that left a lot of raw wax for candles in the area, which gave rise to legends of a buried treasure as well as supposed atrocities. 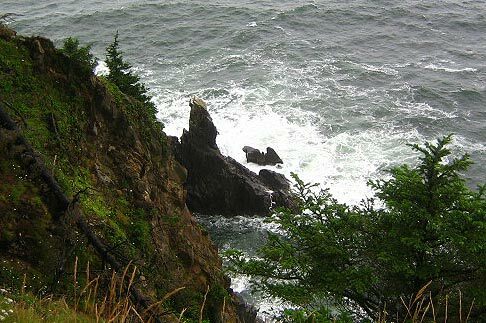 Or the odd rumor that the Nehalem Bay can grant small wishes sometimes in the wackiest of coincidences, which numerous locals and regulars talk about with surprising regularity. Manzanita, however – that cozy north Oregon coast hamlet that sits equal distance between the more bustling tourist havens of Cannon Beach and Rockaway Beach – is full of wild geologic oddities that are quite real. To boot, they are actually gigantic, but either hiding in plain sight or tucked away behind some even larger land mass. It's easy to miss them, unless you're looking rather closely. In fact, it's even quite difficult to find them unless you know where to poke around. 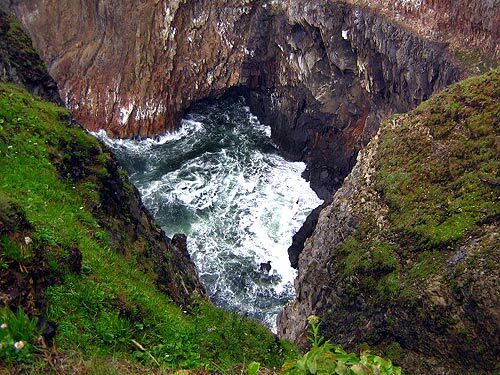 A secret cove or two, and several hidden rock structures make for a different kind of treasure hunting here that simply can't be beat (including the infamous Devil's Cauldron). Case in point: Neahkahnie Mountain itself, that towering, looming landmark that seems to keep watch over Manzanita, but then provides unmatched views when you're halfway up. You can't beat these incredible vistas. But look a bit closer at its bottom area – seen above in this surreal shot at night – and there's a barely-noticed craggy arch of sorts at its tip. It's like Neahkahnie was once actually part of some ancient structure, and this is the only remnant of the castle ruin. Well, maybe not the only one. 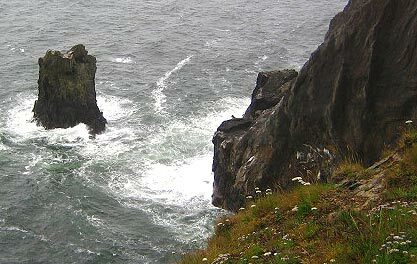 There is also Cube Rock, faintly seen poking its head up over a dip at Cape Falcon, just a tad around the corner from the big overlooks of Neahkahnie. This shot is actually an extreme closeup, taken from the highway. 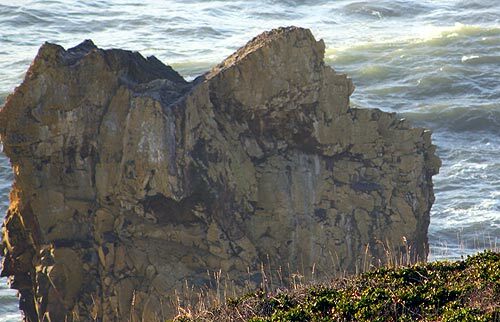 If you hike to the end of these cliffs, and to some secret viewpoints looking straight out to sea, you'll find yourself able to view Cube Rock in its entirety (the name actually goes way back to the beginning of the century, but it's unknown who coined it). Here, it clearly resembles some ancient chunk of a ruin, like a massive column, almost Roman or Greek in style. It's not hard to imagine maybe Atlantis was here once you've seen these massive basalts. 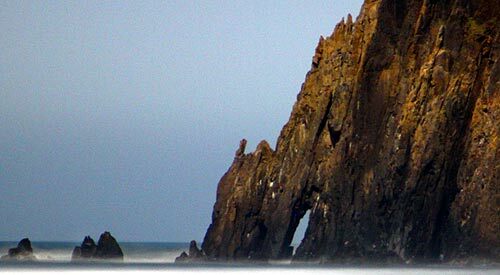 As if this bit of anthropomorphism isn't enough, there's the very secretive Pulpit Rock lurking below the tops of these cliffs, a little south of Cube Rock. That name also goes back to the turn-of-the-century. Another captivating basalt object sits hiding just below the grand viewpoints of Neahkahnie: tons of travelers poke around here each day with their cameras and eye-pieces and almost none ever notice. 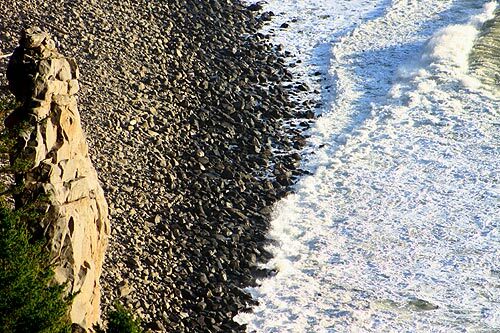 Look down from the gravel pullouts at the shore of giant polished rocks that hugs the bottom of Neahkahnie and you'll see a funky, freaky spire of rocky pointing upwards. Sometimes it's possible to walk that treacherous shoreline below, during extremely calm conditions and low tides. It's said that if you look up, one rock structure above looks an awful lot like the face of a girl – called the “Indian Maiden.” This pointed rocky spire might be just that. It's also said that somewhere along that rocky, boulder-covered shore is a secret sheltered camping spot called “Pirate Bar” - so named because it might just come stocked with booze and/or cooking utensils. Then again, there are a lot of funky legends in the Manzanita area. 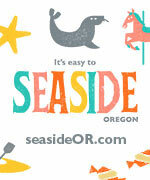 You'll find Mananita about 20 minutes south of Cannon Beach and the Highway 101 junction. The trails to the lookouts for Cube Rock are located at the gravel pullouts that include the trailhead for the longer path to Short Sand Beach – about a half mile north of the main Neahkahnie viewpoints and just south of the entrance to Oswald West State Park.